Today we announced Farm Aid’s 2016 grant recipients. 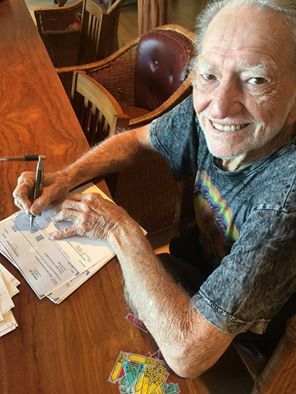 Here’s Willie Nelson signing each of the grant checks before they go out in the mail! $556,315 was granted to 82 family farm, rural service and urban agriculture organizations in 35 states and the District of Columbia. Grants ranged from $5,000 to $20,000. This entry was posted on Thursday, December 8th, 2016 at 11:25 am and is filed under Farm Aid. You can follow any responses to this entry through the RSS 2.0 feed. You can leave a response, or trackback from your own site.